Oh La La Vintage01535 640640work Shop - FashionPut a little "Oh La La" in your life! Browse through our rails and find 1940s utility wear alongside monochrome mini dresses from the 1960s. 1920s glamour to 1980s power dressing! We also sell the funkiest of modern designs from the best named makes and designers. With accessories to compliment we sell hats, handbags, gloves, jewellery, lingerie with a twist of nostalgia and corsets to turn heads and make you feel gorgeous! Oh La La can sell your gently worn garments and vintage wear for you. We operate a clothing exchange policy, so why not give us a call to find out more. The owner of Oh La La, Fashion Past & Present is Pam Howorth. Pam gained her knowledge when she studied fashion at Bradford College way back in the 80s. With a family background in antiques, prop and costume hire for television and film productions. Pam has a wealth of knowledge and will be only too happy to advise you with your purchases. Pam is proud to support Haworth Village Association and once a year organises the fabulous 1940s weekend in May, which sees Haworth transformed back into wartime. If you would like to purchase dance tickets for this event or find out more, just give Pam a call. Put a little "Oh La La" in your life! 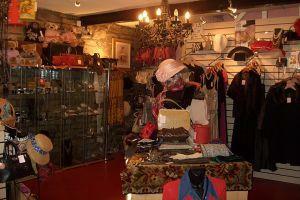 Oh La La was established in 2003 and specialises in selling beautiful lingerie, handbags, jewellery and corsets. Upstairs we also have Haworth's premier dress agency. Selling beautiful clothes at affordable prices. The shop is open most days including Sundays. If you would like to make some room in your wardrope why not bring some garments along to sell. You get 40% of the sale price. The dowstairs shop sells lingerie from well known companies as well as specialist individual brands. Our handbags range from quality leather to delicate embroidered evening bags. We source unique amber jewellery set in contemporary silver. If you would like something special as either a gift or just to treat yourself, Oh La La is well worth a visit.